Happy Wednesday everyone! Today I have a card and bookmark set I made using the Heartfelt Creations newest collection-Flowering Dogwood Collection, to share with you today! For the card, trim a piece of pattern paper from the Flowering Dogwood Paper Collection to 4" x 5.25". Ink the edges with Forest Moss distress ink and stamp the flower branch from the Dogwood Chapel Cling Stamp Set randomly on opposite sides using the same ink. 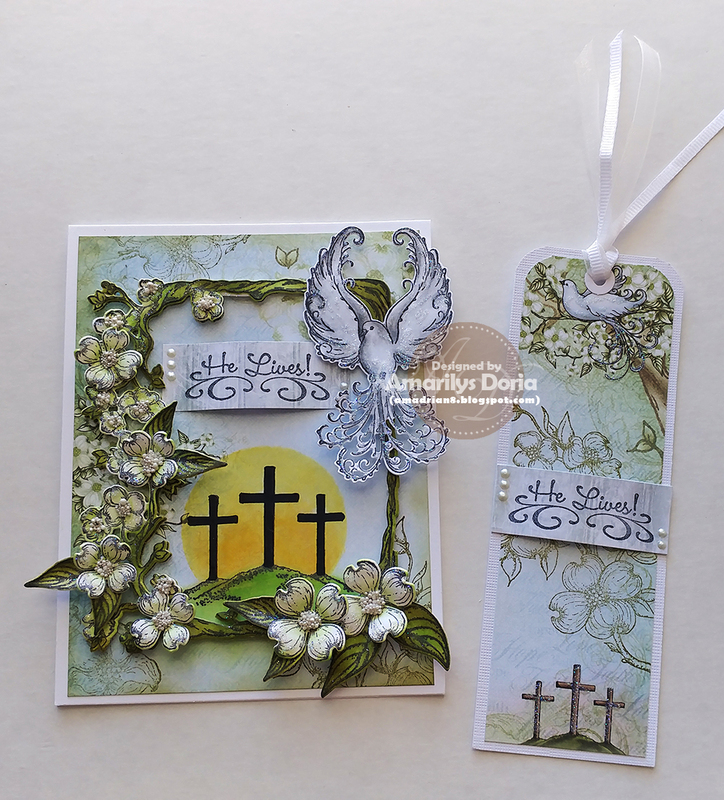 Stamp the 3 crosses using black in in the bottom center of the card. Color with gelatos. Using a sharpie, color in the 3 crosses to turn them into a silhouette. Adhere card front to 4.25" x 5.5" card base. Stamp the dogwood flowers, dogwood frame twice, leaves and dove on white cardstock. Color each image and die cut them using their coordinating die. Shape the flowers and add prills to their centers. Add glitter to all the elements and se aside to dry. 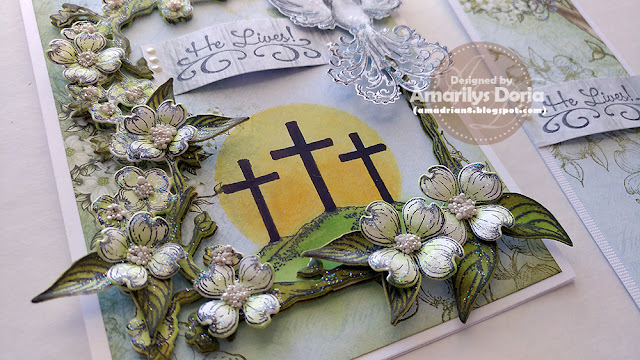 Later the dogwood frames over each other using pop dots to give them dimension and add over the cross image like a window. Add the flowers as shown and the dove to the top right corner. Stamp the sentiment twice on a coordinating pattern paper and trim to fit inside the frame. Add liquid pearls to the title. For the bookmark, trim a piece of pattern paper to 1.75" x 5.5". Stamp the flower branch from the Dogwood Chapel Cling Stamp Set on center of bookmark with Forest Green distress ink. Round off the edges and adhere on a 2" x 5.75" cardstock. Round off thee edges and punch a hole on the top. Add a white circle and add a white ribbon to make your bookmark. 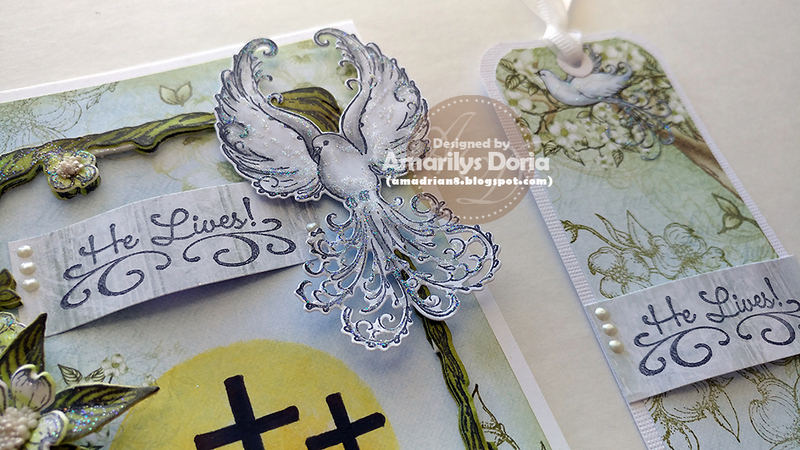 Lightly glitter the images and add stamped sentiment to the center of bookmark. Finish with a few liquid pearl drops.